Submitted Photo Shown is Susan Washington Sipos at the Chautauqua County Genealogical meeting at the Fredonia Barker Library speaking on the history of the Robert J. Gross family. The Chautauqua County Genealogical Society met recently in the Barker Library in Fredonia for a meeting and an informational presentation on the history of the Robert J. Gross family of Dunkirk. President Walt Sedlmayer opened the meeting with a welcome, and had members and guests introduce themselves. Member John Sipos read the minutes of the previous meeting, and treasurer Debbie Kotar read the financial report. Newsletter editor Wayne Leamer gave a report on membership and said that the latest issue of the newsletter is being printed. Secretary Margaret Curtis took minutes of the meeting. Vice President Gail Dash told of upcoming meeting speakers. The June meeting will have a speaker from the SAR. Dash said that the annual open house will be in July, and that the annual summer picnic will be in Cassadaga at the Red House. All historical groups are welcome to join for the picnic. Speaker for the meeting was Susan Washington Sipos on the Robert J. Gross family of Dunkirk. Mr. Gross was with the Brooks Locomotive Works of Dunkirk and became a salesman selling locomotives to other countries. Gross and his wife first lived on Fourth Street in Dunkirk, and purchased the Marshall Hinman house at 715 Central Avenue. The house was replaced by a new house built by Mr. Gross, and he lived there until he died in 1930. His sister continued to live there until she died in 1949. Mrs. Sipos said she was familiar with the house, because her grandfather, the late John Thomas Washington, was the Gross family chauffeur and gardener. One of the cars of the Gross family was a Pierce Arrow, made in Buffalo, and when purchased, he went to Buffalo to be taught how to repair the car by Pierce Arrow. 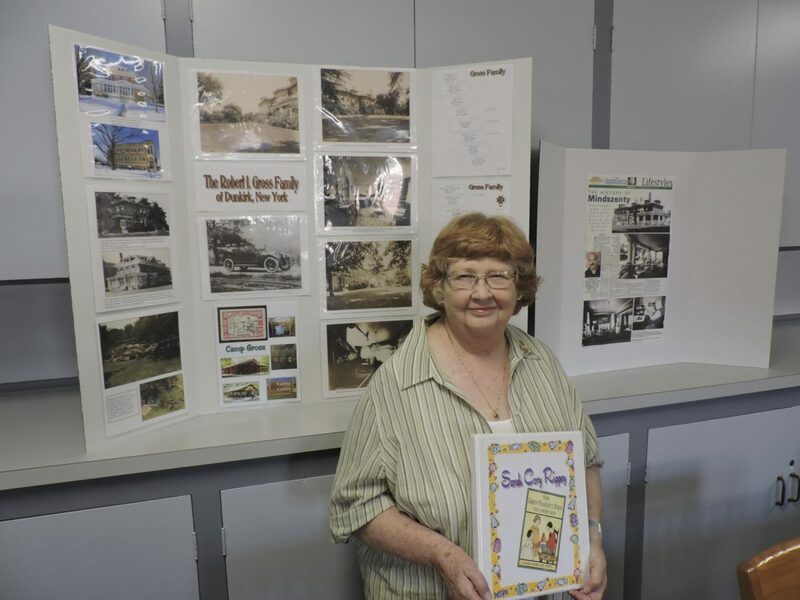 Mrs. Sipos had completed much research on the history of the family, and showed her notebooks of research to all. The Gross mansion was purchased by the Catholic Church and became the Cardinal Mindszenty school in 1950. A fine talk was enjoyed by all.